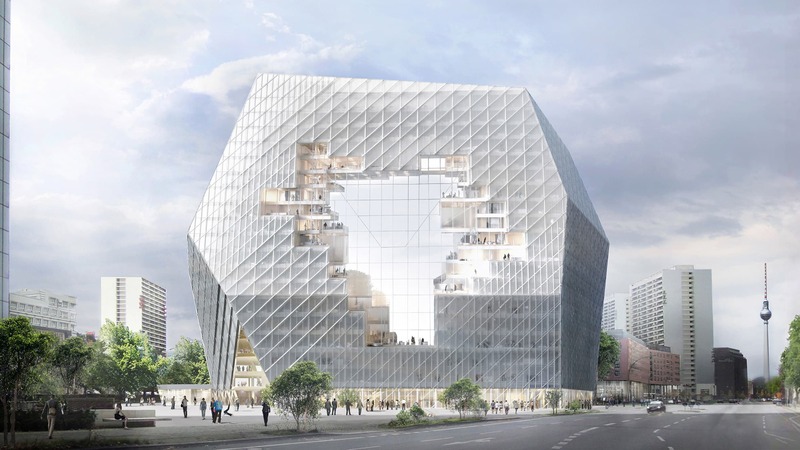 A collaborative cloud forms the nucleus of collective liveliness and manifests itself as the conceptual and open spatial identity of the new headquarters for a digital media enterprise. In an age where (digital) work can be performed anywhere, architecture takes on the increasingly critical role of bringing people (physically) together. For a company whose output is virtual the necessity to provide an identifiable identity – not only an image of identity, but also a place of identity – becomes essential to its credibility and existence. 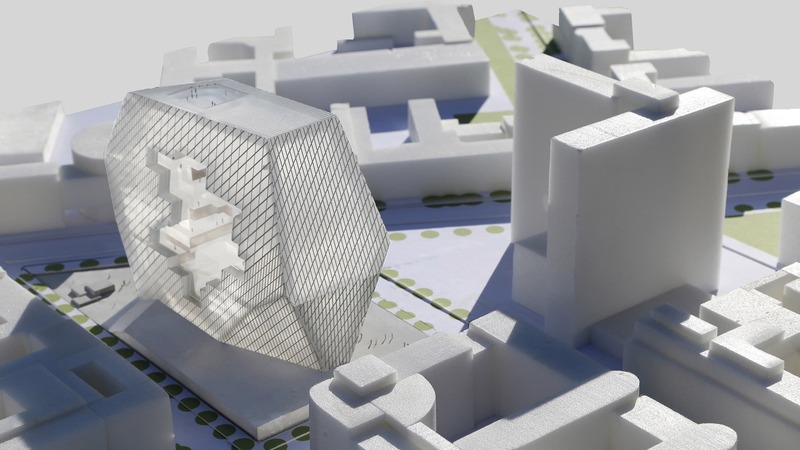 The ‘Collaborative Cloud’ forms the heart and nucleus of the project and manifests itself as the conceptual and spatial identity of the new headquarters: an expressive invitation that attracts the inhabitation of its potentials. Identity is defined not as object, but as space – a pixelated void is carved into the center of the building to create flexible permeable places for imagination, collaboration, and interaction. 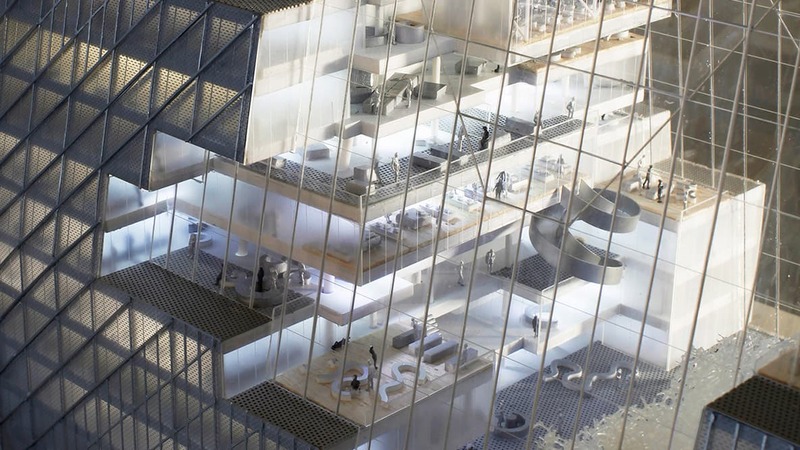 Standardized flexible work spaces are arranged along the perimeter of the building, which dissolve and merge into zones of informal work environments within the Cloud. The invisible alchemy of the digital world is given an open spatial identity, which grounds the virtual in the real and manifests the values, production, and genus loci of Axel Springer as a contemporary digital media company. 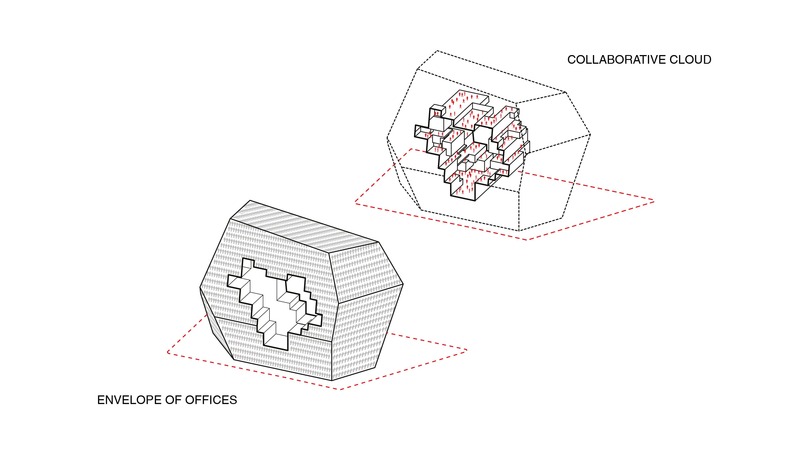 An exterior envelope of generic workspaces that strictly follow the notion of rigorous efficiency tightly wraps around an inner core of collaboration and creativity. 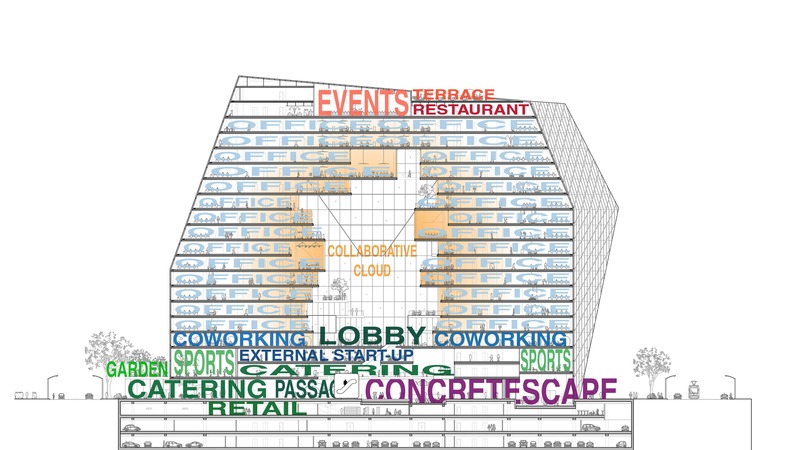 Spaces for informal collaboration occupy the collaborative cloud and are organized around the ‘digital void’ which joins the network of enterprises into a shared sphere of experience and common spirit. 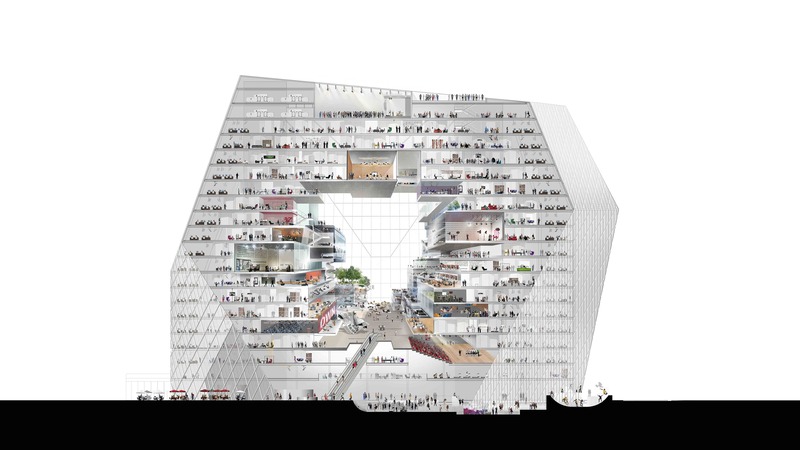 The combination of spaces for informal collaborative interactions towards the center with more formally organized work along the perimeter, provide a gradient of multiple work environments within the building. Digital natives and immigrants are free to occupy and co-opt spaces with various work styles and participate in shared activities within immediate proximity without compromising the serenity of fixed workplaces. The future of the workplace is coexistence with a multiplicity of choices. An orbit of circulation around and through the collaborative cloud provides further connectivity and access in a continuous bi-directional loop throughout the building. The production of digital content is given a circuit that links the digital enclaves into a common unified whole, while maintaining a sense of ‘neighborhoods’ and independence. The organizational structure of the building simultaneously provides a shared framework for the organization itself and generates its image and new identity – a conflagration of content and image for a digital enterprise. 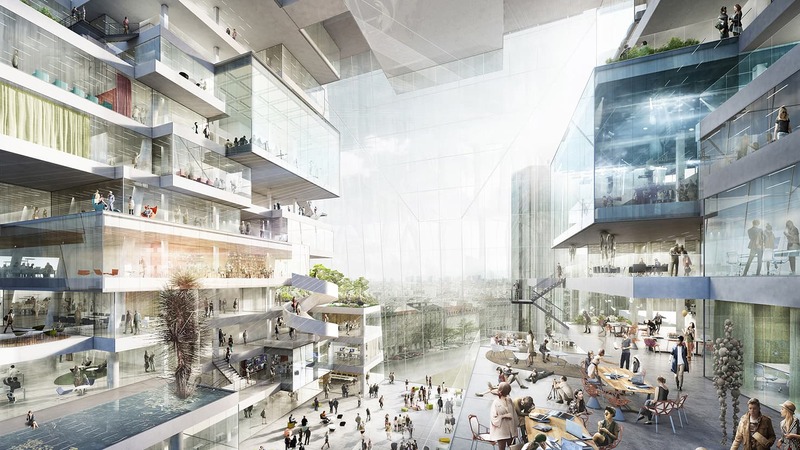 The design proposes an explicit mix of flexible and collaborative office typologies with a diverse array of urban activities and amenities to create a building not only dedicated to internal production, but to the interaction with the city and public domain surrounding it. The facetted building envelope is derived from a three-dimensional interpretation of Berlin’s ‘distance area’ planning regulations, with the vertical facades folding back at the typical urban block perimeter height. 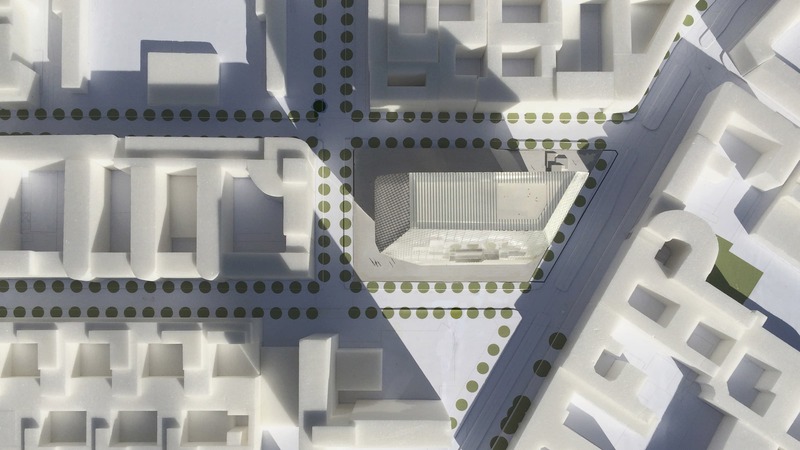 Two diagonal slices narrow the volume towards the bottom and generate two public plazas, one as connector to the existing Axel Springer Tower and the other towards the public along Axel-Springer-Street. A public ‘passage’, one of Berlin’s ubiquitous typologies, traverses the building, retracing the path of the former border between East and West Germany, and connects the two surrounding plazas. The ground levels of the building form a civic base, a ‘market-place’ like environment with cafes and restaurants that animate the plazas, and a terraced ‘concrete-scape’ further connects inside and outside and offers a flexible surface for exhibitions, film screenings and ad-hoc urban activities. An extensive garden forms a green lung on top of the plinth level of the building, which anchors the structure along the block perimeter, while a rooftop space provides a special area for events, with an outdoor terrace offering views across the city of Berlin. The project positions itself in an explicit symbolic resonance with the urban context and the historically charged site – adjacent to the former Berlin Wall, which once divided the city and the world, the building forms a contemporary counterpart to the Axel Springer Tower, Berlin’s first skyscraper. The new building opens a space of imagination and collective experience within the city and conceptually reunites the former East and West, emerging as a symbol of transparency and historic awareness. 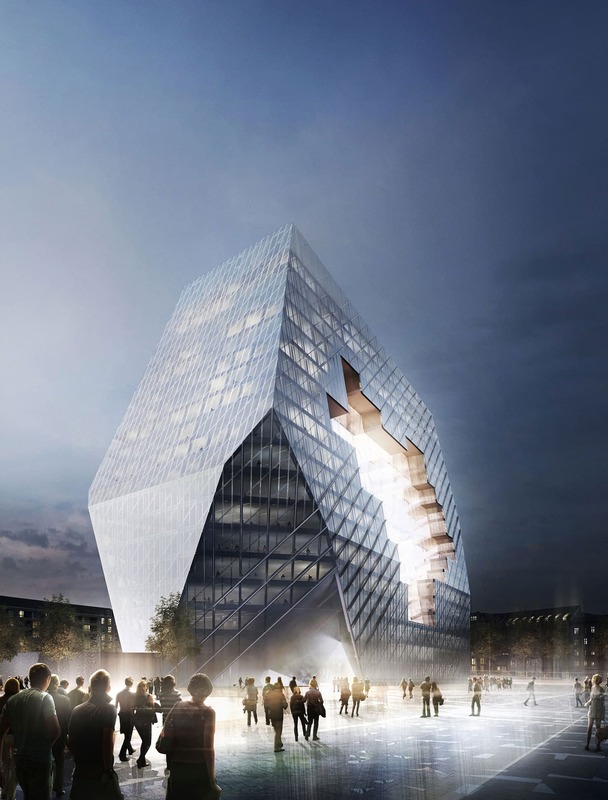 The Axel Springer Cloud not only forms an actual space of shared ideas and collaboration, but also projects its open image as a powerful gesture towards the city, conceptually reuniting its historic divide, as well as the workplace and the city itself in a space of social interaction and shared digital identity.